Burials 1781, St. Peter's, Canterbury - October 24th, George Homersham, son of John Homersham & Ann his wife. An infant. James Homersham (b. 1781 Canterbury  died 1854 Canterbury) who married Mary Lilley in 1803, in St. Stephen, Coleman Street, London. Mary was born c. 1785 and died July 25, 1863, in Canterbury. James Homersham was a Woolstapler. He had his own company, which was listed the 1830 directory - James Homersham & Son, North Lane and 12 St. Peter's Street. Flackton Homersham born 1827 Canterbury, d. 1913 Leatherhead, Surrey at age 87 buried St. Mary & St. Nicholas Church Cemetery Leatherhead, Surrey. Went to the King's School, Canterbury 1835. In 1841 he was living in St. Peter's, Canterbury. He married Julia Osborn Snoulten in 1857. In 1861 they were living in Newington, Surrey. In 1871, 1881, and 1891, they were living in Camberwell, Surrey. In 1901 they were living in Leatherhead, Surrey. He died in 1913, in Westbury, Leatherhead, Surrey. Julia was kind enough to create a beautiful photo album with pictures of people & places that obviously meant something to her and her family. Some of these are not family related so we've created a special page just for her photo's that were obviously lovingly kept and cared for. In 1841, Julia was living in St. George the Martyr, Canterbury, and in 1851 she was in Ewell, Kent. 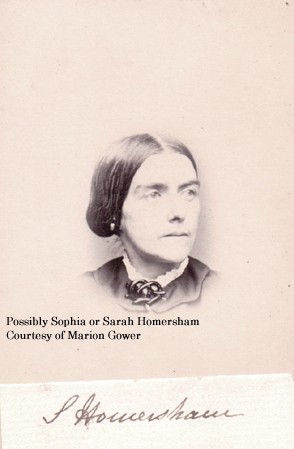 She married Flacton Homersham in 1857 in Dover, Kent. Edward Homersham (born c. 1824 Canterbury - died Nov 12, 1896, Streatham), son of James and Mary Homersham, brother to Flackton Homersham. Married Fanny Ann Pidduck (bapt. September 15th, 1828 - died April 18th, 1875), buried in St. Dunstan's Churchyard, Canterbury. Her parents were William Pidduck and Anne Goldfinch. 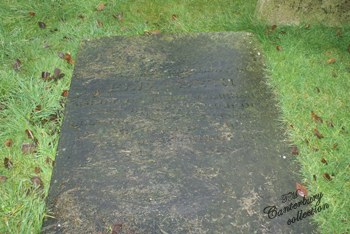 Mrs Edward Homersham (Fanny Ann Pidduck), baptised 15th September 1828 Chartham St Mary, died 18th April, 1875 Blean, Kent. She is buried in the family grave. St Dunstan's Churchyard, Canterbury. Her parents, William Pidduck married Anne Goldfinch (b. c. 1800, d. 1874), in 1824. Batemann Photographer. National Library of Australia - Monday, October 15, 1928 - A. T. Saunders, North Adelaide - In "The Mail" of October 6 is an interesting article on Capt. E. C. Homersham and Eagle's Nest. The despatch of Governor Young of June 5, 1850, mentions the widow of Capt. Armstrong, 47th Regiment, who died on board the Brightman on January 29, 1850. The despatch stated that the widow married Capt. E. C. Homersham, R.N., who was then in Adelaide. It also stated that Mrs. Homersham had a child by Capt. Armstrong. A despatch dated July 24, 1851, mentioned that the wife of Capt. Homersham, R.N., widow of Capt. Artmstrong, wanted a land or other grant. "The Adelaide Times" of July 13, 1850, records the name of "E. C. Homersham" as owner of Section 1043, Onkaparinga, containing 88 acres. "The Observer" of August 23, 1902, records the death of Mrs. Homersham at the age of 93 years.